Action from Cardea's 4-1 win at Peterborough NECI (blue) in the semi-final of the PFA Minor Cup. Photo: David Lowndes. AFC Stanground Sports reckon they have made a season-changing signing in Louis Shepherd. Shepherd, Ramsey-born, but a recent native of Australia, has bagged three goals in his first two appearances for the city club. Action from the PFA Minor Cup semi-final between Peterborough NECI (blue) and Cardea. Photo: David Lowndes. Both matches have been won, most impressively at ICA Sports, a 2-0 success which was followed by a 3-1 win over Holbeach Reserves on Saturday (March 18). Shepherd scored twice against Holbeach. Josh Staggs also scored for a side who have emerged from a dodgy spell to climb back up to eighth place in the Peterborough Premier Division. It’s as you were at the top as top three Peterborough Sports Reserves, Pinchbeck United and Moulton Harrox all claimed hard-fought victories. Ian Bradbury scored twice as Sports won 3-1 at Ketton to maintain their four-point lead, while the division’s leading marksman Ollie Maltby inevitably scored twice in Pinchbeck’s 3-1 win over ICA Sports. A Joshua Smith goal had ICA level at 1-1 at half-time. Gary Gibbs (stripes) was on target for Peterborough Sports Reserves at Ketton. Harrox beat Sawtry 3-0 with goals from Marcus Parry, Joe Townsend and Jake Cawthorne. Fourth-placed Netherton United were frustrated as scheduled opponents Wisbech Town Reserves cried off 24 hours before kick off after failing to raise a side. Stamford Lions would be challenging hard for the top four if they hadn’t had seven points deducted for a couple of misdemeanours. Lions made it nine Premier Division wins in a row with a 5-2 home success over Leverington with Luke Ball (3) and Rob Forster (2) sharing the goals. Crowland’s slump under new manager Ian Mcintosh continued as they lost the basement battle at Uppingham to crash to the bottom of the table. It finished 1-0 to Uppingham which is a third game in a row without a goal for Crowland. Lowly Stilton won 2-1 at Deeping Rangers Reserves thanks to goals from Ritchie Baines and Gavin Cooke. 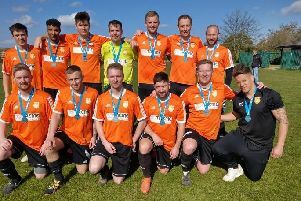 Division Four promotion hopefuls Cardea reached the PFA Minor Cup Final with a 4-1 win at Division Five title hopefuls Peterborough NECI. Shane Cooke (2), Richard Kay and Kelvin Fletcher scored the goals. And the PFA Challenge Cup Final will be contested by runaway Division One leaders Moulton Harrox Reserves and Division Two promotion chasers AFC Stanground Sports Reserves. Harrox required penalties to see off Whittlesey Athletic Reserves. Stanground pipped Division One side Glinton & Northborough 1-0. Uppingham Town 1 (Bennett), Crowland Town 0. Postponed: Netherton United v Wisbech Town Res (Wisbech couldn’t raise a side). Whittlesey Athletic Res 1 (Redhead), Moulton Harrox Res 1 (Earth). (Moulton won 5-3 on penalties). Peterborough NECI 1, Cardea 4 (Cooke 2, Dandrilli, Fletcher).